The Globus is a sophisticated mobile workstation designed by Michiel van der Kley for Artifort in in cooperation with Gispen. Displaying an innovative and compact form, Globus captures your heart from the very moment. 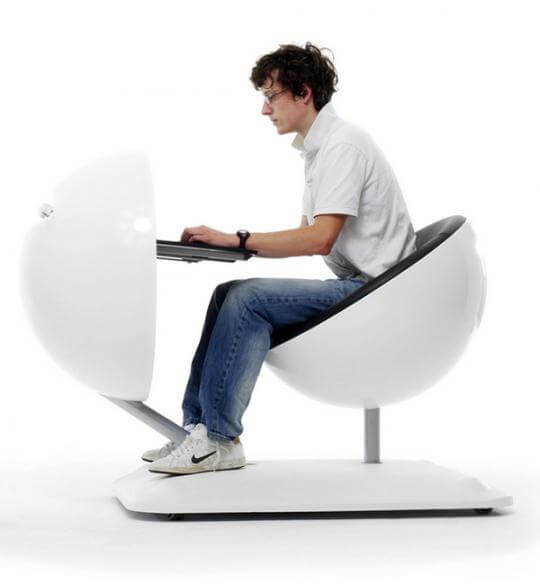 Originally designed for an office environment, this remarkable workstation folds into a perfect orb and it can be used in a house as well, being an intelligent choice for today’s flexible employee. It has got wheels and you can move it around, you can take it with you and put it wherever you want in the home. The outside finish is white lacquer, with black inner upholstery that matches the work surface and turns it into a captivating interior object. Meanwhile, Globus has become Globit, an updated version featuring a built-in Windows XP mini-PC and SiteKiosk which makes it ideal for public areas where users can use the touch-screen to navigate through specific websites easily and comfortably. It won the ” Good industrial design award” in 2008.